This really shows a lot of improvements in comparison to the iPhone 5. – Faster A7 processor with a new building process in 28nm and its 64bits which makes everything works faster. – M7 Coprocessor its designed to measure motion data from the accelerometer, gyroscope, and compass — a task that would normally fall to the A7 chip. But M7 is much more efficient at it. – 8 MP back camera with improved sensor. – Fingerprint reader called TouchID what will allow you to unlock your phone without the need to enter a password. The same sensor will allow you to login to the Apple store to avoid entering your password each time you buy something. – Incorporates dual flash LEDs so you can take better pictures in low light scenes. – Serial shot mode to take multiple pictures in a row and possibility to set manual exposure. Slow motion capabilities when shooting video. The new version of the Apple mobile Operating System has been officially announced too and will be available publicly on the 18th of September for all compatible devices. This new version changes a lot the design and adds a lot of new features. It will be compatible with the following devices: iPhone 4, iPhone 4S, iPhone 5, iPod touch fifth-gen, iPad 2, iPad 3, iPad 4 and last year’s iPad mini. Keep in mind that not all devices will get all new iOS 7 features, this is actually good because otherwise devices with lower hardware specs would run very slow, the new interface works with a lot of transparencies and shadows to enrich the visual experience. All the iPhone 5 lineup will receive the full version iOS 7. 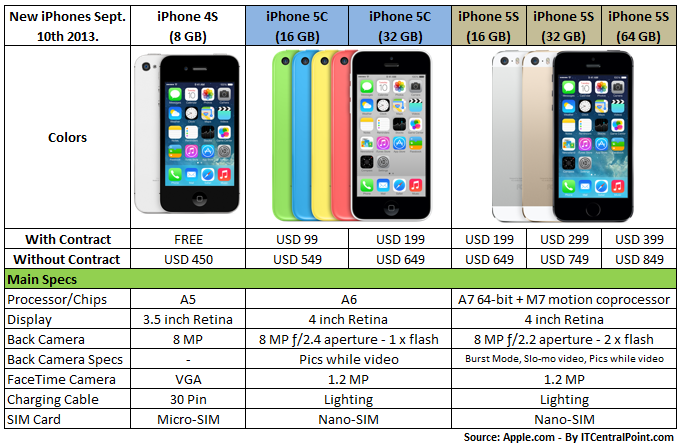 I was expecting to see the iPhone 5C line up with a lower price (USD 450 or less) but because they decided to maintain the iPhone 4S as the basic model the price didn’t go down more. In the end its the same iPhone 5 which is great but with a very nice polycarbonate so there was not a big justification to lower the price more aggressively. Andy Ihnatko that assisted to the Apple event and was able to test both iPhones on site, commented live in Twit´s MacBreak Weekly Podcast: “If companies are going to use plastic, this is the way to do it, it feels very nice in the hand, high quality”. (I cant remember his exact words but they meant this). I like what Apple released, a lot of people is already complaining over different social media channels, and I believe a lot of people also complain just because they cant afford Apple products. As I read once: “You don’t have to hate what you cant afford”. I agree they are not cheap, but they are really great products, and my intensive experience with Apple devices started less than 2 years ago! All the other things a lot of people were expecting like a refresh line of the Mac Book Pro´s will probably be announced on the October´s event where we will probably find new iPad´s, new MacPro´s, and the release of the new Mac OS “Mavericks”. I am really looking forward to this event!